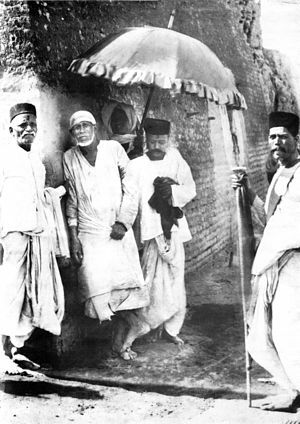 In 1858 Sai Baba returned to Shirdi. Around this time he adopted his famous style of dress consisting of a knee-length one-piece robe (kafni) and a cloth cap. Ramgir Bua, a devotee, testified that Sai Baba was dressed like an athlete and sported 'long hair flowing down to the end of his spine' when he arrived in Shirdi, and that he never had his head shaved. It was only after Baba forfeited a wrestling match with one Mohdin Tamboli that he took up the kafni and cloth cap, typical Sufi clothing. This attire contributed to Baba's identification as a Muslim fakir, and was a reason for initial indifference and hostility against him in a predominantly Hindu village. According to B.V. Narasimhaswami, a posthumous follower who was widely praised as Sai Baba's "apostle", this attitude was prevalent up to 1854 even among some of his devotees in Shirdi. For four to five years Baba lived under a neem tree, and often wandered for long periods in the jungle around Shirdi. His manner was said to be withdrawn and uncommunicative as he undertook long periods of meditation. He was eventually persuaded to take up residence in an old and dilapidated mosque and lived a solitary life there, surviving by begging for alms, and receiving itinerant Hindu or Muslim visitors. In the mosque he maintained a sacred fire which is referred to as a dhuni, from which he gave sacred ashes ('Udhi') to his bhakats before they left. The ash was believed to have healing and apotropaic powers. He performed the function of a local hakim, and treated the sick by application of ashes. Sai Baba also delivered spiritual teachings to his visitors, recommending the reading of sacred Hindu texts along with the Quran. He insisted on the indispensability of the unbroken remembrance of God's name (dhikr, japa), and often expressed himself in a cryptic manner with the use of parables, symbols and allegories. Sai Baba participated in religious festivals and was also in the habit of preparing food for his bhakats, which he distributed to them as prasad. Sai Baba's entertainment was dancing and singing religious songs. After 1910 Sai Baba's fame began to spread in Mumbai. Numerous people started visiting him, because they regarded him as a saint with the power of performing miracles, or even as an Avatar. They built his first temple at Bhivpuri, Karjat. Sai Baba left behind no spiritual heirs and appointed no disciples, and did not even provide formal initiation (diksha), despite requests. 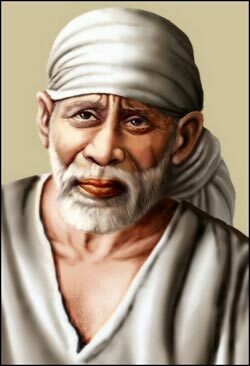 Some disciples of Sai Baba achieved fame as spiritual figures, such as Upasni Maharaj of Sakori. After Sai Baba died, his devotees offered the daily Aarti to Upasni Maharaj when he paid a visit to Shirdi, two times within so many years. Nana Saheb Chandorkar: Deputy Collector – legend has it that Sai Baba saved this man's daughter from labor complications. Ganapath Rao: police officer who resigned to become an ascetic, and also known as Das Ganu. He was an itinerant who spread Sai Baba's message. Tatya Patil: had immense faith in Sai Baba and served him until Sai Baba took samadhi. Sai Baba used to treat Tatya Patil as His nephew. Baija Mai kote patil: Sai Baba treated her as His elder sister and equivalent to mother. She was Tatya Patil's mother. Haji Abdul baba: He served Sai Baba until Sai Baba died in 1918. Madhav Rao Deshpande: Later known as Shama, one of the staunch devotees of Sai Baba. Govindrao Raghunath Dabholkar (Hemadpant): Sai Baba allowed him to write the Shri Sai Satcharita. Mahalsapati Chimanji Nagare: A priest of Khandoba Temple. RadhaKrishna Mai: A great devotee of Baba, cleaned the temple every day and looked after Baba's needs. 01. Whoever puts his feet on Shirdi soil, his sufferings would come to an end. 02. The wretched and miserable would rise into plenty of joy and happiness, as soon as they climb steps of my samadhi. 03. I shall be ever active and vigorous even after leaving this earthly body. 04. My tomb shall bless and speak to the needs of my devotees. 05. I shall be active and vigorous even from the tomb. 06. My mortal remains would speak from the tomb. 07. I am ever living to help and guide all who come to me, who surrender to me and who seek refuge in me. 08. If you look to me, I look to you. 09. If you cast your burden on me, I shall surely bear it. When Sai Baba first came to Shirdi it had of no basic facilities. There was a well put only in name. It had no natural spring water and if ever there had been one, it must long ago have dried up. Water had to be fetched from a distance. When, therefore, Sai Baba gave his permission to the villagers to celebrate the Ram Navami Fair, (Baba's Birthday) the big problem facing the organizers was one of water supply. So What should they do but go to Sai Baba with their problem? "'Oh yes," said Sai Baba, 'so you want plenty of water, do you? Here, take this and drop it in the well and wait and see." "'This," turned up to be a platter of flowers on which some prasad (blessed food) had been placed along with the remnants of alms Baba had received earlier in the day. The villagers had no qualms about doing as they were did. Their faith in Sai Baba was total. No sooner had that platter of leaves been dropped in the well, it is said, water rose from the bottom as if by divine command and completely filled it. And great was the rejoicing of the people. These were instances of things they had seen with their own eyes. It was not secondhand information they had gathered. Sai Baba was to them as real as their homes and their fields and their cattle and the distant hills.Das Ganu once had an unforgettable experience. On a festive occasion, he sought Baba's permission to go to a place called Singba on the banks of the Godavari to have a bath in the holy waters. "No," Baba replied resolutely, "where is the need to go all the way when the Godavari is here right at my feet?" Das Ganu was vexed. He was willing to concede that Ganga the holy river (Baba frequently referred to Godavari as Ganga) rose from the feet of Sri Narayana (one among the Hindu trinity of Gods) himself, but his faith was not deep enough to believe that the waters of the Godavari could spring form the feet of his master, Sri Sai. Baba who was reading Das Ganu's mind decided that this was the time to strengthen Das Ganu's faith. He told his devotee: "come closer to me and hold the hollow of your palms at my feet!". As soon as he did so water flowed freely out of the toes of the master's feet and filled the hollow of Das Ganu's palms in no time. His joy knew no limits. He sprinkled the water on his head and his body and distributed some more among the assembled devotees as tirtha (holy water). There was that other occasion when many thought that the masjid which housed Sai Baba itself would be consumed by fire from the flames which leapt up from the dhuni. All that Baba did was to take some swipes at a wooden pillar in front of him. With every blow the flames subsided and the fire died down. "Miraculous," said his devotees. Often they would notice him stirring some hot concotion over the kitchen fire, not with a ladle but with his bare hands. There never was a time when his hand was scalded. What supernatural powers did he have? On yet another occasion, Sai Baba was partaking of food with three of his devotees in the masjid when, without any cause for provocation, he exclaimed- "Stop!" Then, as if nothing had happened, the four continued with their meal. Lunch over and the dishes cleared, they stepped out of the masjid, when large chunks of the ceiling fell on the very spot where they had been seated only a few minutes earlier. Did Sai Baba's powers extend even to inanimate matter, the devotees wondered. Instances have been quoted by his devotees as to how Sai Baba commanded the rains to stop and the winds to cease. Baba always maintained the "Dhuni" or the perpetual fire. The realisation that all the phenomenons of the nature are perishable and unworthy of our craving, is signified by "Udi" which Sal Baba distributed to all. Baba never left Shirdi. He talked to people who came to see Him. Sal Baba would often speak in symbols and parables leaving his devotees to work out the answer - such as, "A man had a beautiful horse, but no matter what he did, it would not run in harness. An expert suggested that it should be taken back to the place from where it had come. This was done and it become tracable and useful". The explanation of this story is that the horse is the Ego. As commander of the physical and mental powers of man, it is useful but self-willed and therefore cause endless trouble. Taking it back to its source is re-absorbing it in the spirit source which it arises. It is the return to the source which purifies and enlightens. From there the ego issues forth again, no longer an ego, but a conscious agent of the spirit. Baba would ask for Dakshina (money offered with respect to the Guru) from some of those who came to see Him. This was not because he needed their money. This was one of Baba's methods for testing out the devotee's attachment to worldly things and willingness to surrender his ego. Once one has surrendered himself totally to Him, Baba takes care of all His spiritual and temporal needs. Baba regarded money like everything else, in a symbolical manner. He once said, " I ask only from those who the fakir (God) points out and in exchange I give them ten times as much". By the end of the day, all the money Baba had earned was distributed to the destitute, poor, sick and the needy. Baba used to feed the fakirs and devotees and even cook for them. For those who were accustomed to meat, he cooked meat and for the others vegetarian fare. The Dwarakamayee of Sai Baba was open to all, irrespective of caste, creed or religion. Among those who came to see him and got his darshan (establishing spiritual contact with the Guru) and blessings were ministers, government officials, business people and village folk. He was the common man's God. He Stayed with them, hejoked with them, He slept and ate with them, he smoked a chillum (pipe) with them, he sang and danced with them, having no pretensions of a God. But all of them Knew that He protected them. Even today, though He has left his gross body, they feel his presence and realise his worth all the more. Baba would also refer to the sounding of the drum of the beginning of eternity within the soul. This "anahat" sound emerged from Baba's heart from every limb, every bone and pore of his body. It was permeated with divine essence and Baba claimed that though one day his physical body will not exist, his remains will communicate with from the grave. Therefore, the most important place in Shirdi is Baba's temple - the Samadhi Mandir is his grave, which literally millions have visited and still continues to draw many more.